On September 8, 2018, over 30,000 people gathered in the streets of San Francisco to march for climate awareness. The march was called Rise for Climate and focused on jobs, the environment and social justice. The diversity of marchers was inspiring. As I began the march, I hoped that together we could shake the world in a gentle way. As the Climate Summit unfolds this week there will be events, gatherings, and conversations from people all over the world. For example, a group of women active in climate change from Mongolia, the South Pacific and Bangladesh will be meeting in Sausalito to discuss their initiatives with community members. Together we will begin a gentle shake. On the other hand, maybe it’s a big shake? On Wednesday, Grace Cathedral hosts the beginning of the Global Climate Action Summit with an interfaith gathering. Speakers from around the world will meet for conversation and reflection.You can join through the livestream. In this magnificent setting we will gather to not so gently shake the world. If you attend, watch for a surprise at the end of the service. If you look up, I’ll be in the catwalk helping with other volunteers deliver the surprise. Gently shaking the world with joy and hope. At Fort Mason there is a month long exhibit called Coal and Ice. A photographic essay on climate change. This is a spectacular story that weaves our international reality with hope. Next door, is the Green Film Festival sharing stories of inspiration, science, education, and vision. All week long there are events in San Francisco where individuals and groups will turn a gentle shake into a wave of momentum. Whether you live in the Bay area or not, what is one way you could gently shake the world towards climate awareness and action? Is a hurricane barreling towards your shore this week? Is there a fire in your neighborhood or in a national forest in your state? Is your classroom over 90 degrees in September even though you live in a northern tier state? Do you need air conditioning while never dreaming you would need AC? Wherever you are, think about your climate and what you want to do to shake the world this week. 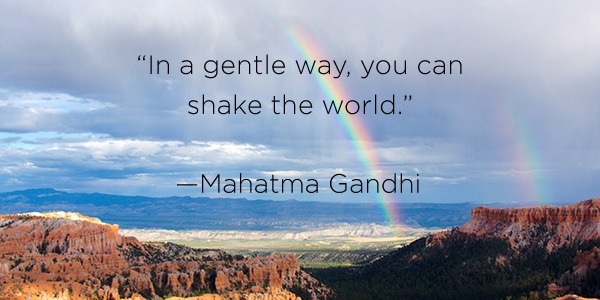 If gentle is not your speed, then shake however you want to shake the world, but please shake it! Together we can turn one little shake into a wave of momentum! Meanwhile, I’m thinking about climbing to the top of the cathedral! Hopefully, I won’t be shaking in my bones.